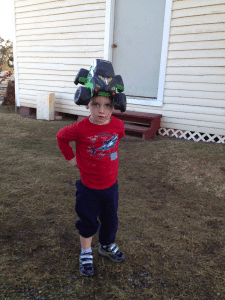 Home » What We're Doing » Family Activities » Guest Post from The Seasoned Dad: Monster Jam! 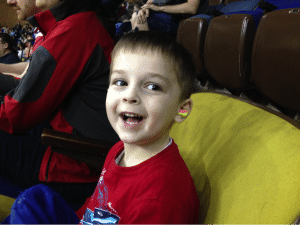 Guest Post from The Seasoned Dad: Monster Jam! Greetings The Seasoned Mom blog readers! I am Blair’s husband, Keith. For the most part, I have remained in the background for the first year of the SeasonedMom.com, and for good reason. I am not particularly talented when it comes to cooking or crafts. Unless, of course, we are talking about cooking large slabs of meat on the smoker or grill, then perhaps I can bring something to the table. But, the time had come for a guest post from Mr. Mom. Much to Blair’s dismay and confusion, I have always advocated that it is important to expose our children to unique experiences, whether they are educational or just pure entertainment, and even if they are considered a bit “trashy” or inappropriate. I say enjoy all that is great about this country, such as big trucks, loud engines, and general tomfoolery with motor vehicles! Gibbs and Casey love trucks, which is no surprise. You combine big trucks and even bigger tires, and you have the dream combination of “Monster Trucks.” When I learned that the long standing Monster Truck show, Monster Jam (www.monsterjam.com) was coming to Virginia, I tentatively floated the idea of taking the boys to the event with Blair (waiting until she was in a receptive mood, of course). Surprisingly, she said yes! 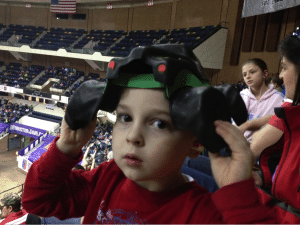 So, off we went to Monster Jam at the Richmond Coliseum. Naturally, I was excited and told the boys well before the event. Huge tactical error, all morning leading up to the show, they were bouncing around like Tasmanian devils on ecstasy. The event kicked off at 2PM, a perfect family friendly time. Many of the Monster Jam events start at night, which is not convenient for little guys, but we got lucky with this timeslot. This event did have what is called a “Pit Party” starting at 1PM, which is where they allow ticket holders to come down to the arena floor and check out the trucks up close. This would have been a blast for Gibbs and Casey, but also would have made for a long day, so we skipped that. When the show began, they dimmed the lights and the roar of the monster truck engines could be heard from underneath the stadium. 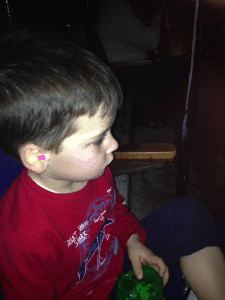 The boys had their ear protection in (absolute must) and eagerly awaited the trucks! Gibbs was about to explode with anticipation! Casey was internalizing everything, dead serious, not sure what to do or say. Breathless! The trucks came roaring out of the tunnel in formation. Wow! The noise was intoxicating, and gas fumes from nitrous-injected motors only added to the thrill! The first truck to come screaming out is known as “Illuminator” because it was wrapped in neon lights. Neon lights, engines roaring. Now, this was ‘Merica and the boys were soaking it all in. For those who have never been to a Monster Truck show, they basically have two formats. There is “freestyle,” where the trucks each have a turn to impress judges by jumping cars and doing spectacular tricks, and the other is where they race (1-on-1). We took in the race format. Naturally, the boys really just wanted to see the main attraction, Grave Digger. Conceived by driver Dennis Anderson in 1981, The Grave Digger is a1952 Sedan Delivery Truck with skull and bones painted on the side, and haunting red headlights. It was awesome when I first saw it crushing cars back in the 1980s, and it still gets the fists pumping today, whether you are 4 or 64. Grave Digger won its first race and the boys went nuts! By the time the initial round of racing was complete, the boys were ready for treats! You cannot attend a Monster Truck show without buying overpriced souvenirs or cotton candy. We did both. Bring lots of lettuce, Dads. One hour into the two hour show, the boys were done, and ready to head out. Little men can only handle so much adrenalin and exhaust fumes! Dad made them take one last picture outside the Coliseum. They were spent and not in the mood for posing! 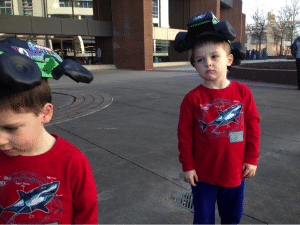 By the time we got home, they were running in the house to tell Mom about their experience and show her their Grave Digger hats! A successful end to the day.